Satusuriku No Tenshi or Angels Of Death is a Summer 2018 anime that aired 12 episodes after a promised 16, and then aired the last four in ONA form. The entirety of the show aired from July 6th to October 26th 2018. It is based on a manga by the same name which was created by Sanada, Makoto (Story) and Nazuka, Kudan (Art). 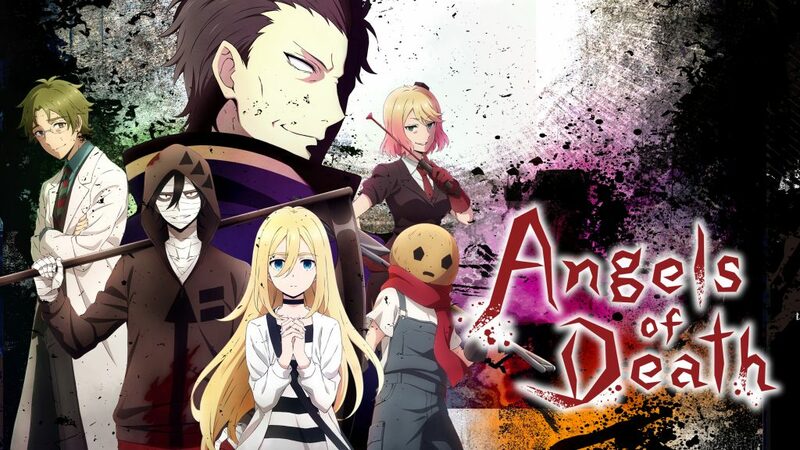 The manga was made based on a RPG Maker game of the same name (Angels Of Death). It falls under the Adventure, Horror, Psychological, Thriller genres and was produced by Lantis with the JC Staff studio at the helm. As always I would like to put a disclaimer here. These are all my views and opinions on Satsuriku No Tenshi, and I am in no way opposing anything anyone may have about this series. With that out of the way, let’s begin. Satsuriku No Tenshi was an interesting show for me. A sort of a breath of fresh air. It wasn’t a type of show that I had watched much or at all in the past and was a welcome change; however, it is not an amazing show, and you will see why soon. I was struggling to pick between a six or a seven for this segment, but due to one thing I dropped it down. That would be the hook. The first few episodes of the series were interesting and fun to watch, but then it got a bit boring and felt like it dragged on. Every episode ran the same formula and I started to lose interest, I even dropped the show for a while in favour of Haikyu. The show picks itself back up later with the reveal of Zack’s backstory, whose hype still died after one episode, and then with the plot twist which I didn’t expect and was an entire 180-degree shift for everything I thought about the show, I loved that twist. However it still did not manage to keep me interested and excited or even invested in the characters. The world or building that this show is set in is not very developed, but then again, it can’t be developed because there really isn’t much to develop, throughout the show only the purpose and the working of the building are revealed. Now onto the main story, as I said before the story is completely unique, one that I haven’t seen before but follows a sort of old, died out trope of the characters being stuck in a building or place, reminiscent of older RPG games, which makes sense as the show was originally a game. However, in total, the story of the show was an intriguing one and I enjoyed the premise a lot, the total 180-degree twist was also a welcome change. In my opinion, the characters were the best part of Satsuriku No Tenshi and that’s a shame because the characters were not all that amazing either, but they were rather good. Firstly the voice actors, they certainly played a big role in how I saw the characters in the show and I have to say the voice actors for all of the characters were exceptional. They all suited the characters behaviour and personality and nothing felt out of place. Now onto the characters themselves, our main girl, Rachel “Ray” Gardner was a nice character to have as a sort of protagonist and certainly exhibited behaviour that I didn’t expect. She is well developed in the first and second episodes but beyond that she stays the same, and rather plain, until the plot twist where our entire perception of her is also turned 180-degrees. Zack is an interesting character, and probably my favourite. He changes and develops a lot throughout the show and witnessing that as well as how it affects his relationship with Rachel is great. The side characters or our Angels Of Death are there to serve their purpose and they do. Each one’s personality is developed and revealed throughout their presence in the show and each one feels unique in their own sinister way. The OP is cool. It’s a decent track but not a memorable one, it doesn’t tie to the themes of the show or the characters though which is a huge letdown. The music throughout the rest of the show feels like it’s just there, there are a few dramatic moments where the score makes an impact but apart from those places it feels irrelevant and I majorly ignored it because it just wasn’t prevalent or noticeable. The animation for the show is clean and precise, there are no rough edges or drawings which create an effect in many shows. The show doesn’t have much action but when there is some, the animation is not dynamic and doesn’t go well with the action. Apart from that I actually like the plain animation of the show, it’s pretty, you can call it almost minimalistic, and it works well with the premise of the show. The show is fun to watch and the story is interesting as a whole with a pretty nice premise. It’s the sort of story that you want to know the ending of and don’t want to wait for it. Well that’s my issue, I think that the pacing really messed it up for me, I believe the show ran too slowly and that ruined the experience for me and caused me to lose interest around episode 5 or 6. This failure to keep the audience’s attention due to slow pacing amongst other issues makes people lose interest and drop a show, and I did drop it for a month or so, before picking it up again after remembering how interesting the premise was. That’s the reason this has a low score for enjoyment. To conclude, Satsuriku No Tenshi is a good show, not amazing but not terrible either. It has a clear cut and intriguing premise as well as a good first four episodes. After that the story’s pacing drops a lot and you begin to lose interest in what’s happening. It’s around this point that the show fails to capture the audience and keep them hooked to what’s going on, despite how good of a story the whole thing actually has. If there were subtle hints and foreshadowing dropped about the twist, it probably could have remedied this issue and kept me from losing interest. Speaking of the twist, the show kind of picked itself up again but not completely. It was a mediocre ride from then on, and the show failed to live up to the potential it could have had, especially with a premise like that.